March has been schedule intensive- in addition to my regular schedule, I played a chamber music concert and bluegrass performances, an orchestra concert (plus extra rehearsals for that) worked alongside students and our local maple festival serving pancakes, hosted a student recital, and flew to Las Vegas for my sister’s wedding. Not a lot of barn time, but to everything there is a season. I’d considered trying to get to the Foxcatcher ride this weekend but I haven’t put on the miles to ensure her fitness is ready and it’s too far away to haul for a maybe…. It appears they’ve just had a snowstorm and are expecting more so in the end that’s ok.
For now I’m setting my sights toward No Frills (my favorite ride) at the end of the month. This year has been quality over quantity in my riding. Our connection is better than ever, her feet are still improving, her body is in great balance… there’s a good base in there. My intention is to get some more serious mileage on her legs in the next two weeks and see how she takes to it. It’s new territory for me so I’ll stay flexible and roll with it learning along the way. Saturday was the first day I’d had the time and weather to get some decent miles in. I hit the barn in the early afternoon with a plan A (a 15 mile one-way ride toward home) and ended up in plan B (about half the distance). When I approached Khaleesi to halter her she walked off, then bucked and trotted out into the field. Even stronger message was sending the mustang to run interference (I watched her do this more than once). For the first time in a long time the mustang didn’t back off when I asked her for space. In fact she pinned her ears and squared up with me. Here was are. She’s not coming. The mustang is blocking me as well. That’s interesting. I don’t have the proper tools for this situation. So I insisted on one good step back from the mustang and when she complied I turned to hike back to the barn and grab my flag. No matter the reason in her horse brain I won’t take it personally. Just get the proper tools and come back and do what it takes to reconnect. Once I retrieved the flag and began heading back to the field I realized I was mentally preparing for something- I wasn’t sure what would happen next but I had assumed it would be a challenge. How would I succeed? Wait. Am I getting into win-lose mode? Too goal oriented? Don’t I know better by now? I realized how important it was that I walk back into the field freshly curious to what was there in that moment and not imposing what I thought I would find. Even though there was some evidence from the very recent past that she may not. If I’m not careful- I return to the field with a mindset that I’m walking into a conflict. That is never a good way to approach any human or animal for success in connection. So I decided to stay present and observe what was happening now without judgement from what happened 5 minutes ago. With the flag in hand it was very easy to ask the mustang to stay out of my space bubble. Which she did. This gave me the space I needed to ask for Khaleesi’s attention which in not too long a time she indeed gave me. It was a short time then for her to connect and come with me willingly to the barn. Still, the extra time screwed up my drop off plan so I went ahead to the shorter ride and took the pressure off myself to rush. Maybe that was the ride she needed anyway. The entire process from field to trail was easy and the ride was lovely. Everything about the afternoon was smooth and enjoyable. We were a team! And finally the sun was shining and it was almost warm as well. I reflected on how important it is to let go of the past and stay present. If I would have approached the mares expecting a fight I would have likely gotten one. How often do I not realize this happens in life? at home? at work? How often do I take past (even recent past) experiences with another person and carry it to the present situation? How often do I have my defenses ready due to past experiences before assessing the present conditions? Isn’t that what many of us are celebrating this season? If you consider the Passover- be ready… after hundreds of years in slavery eat with your shoes on your feet because any moment could be the time you’re delivered. Or the resurrection of Jesus- in most people’s experience dead people stay dead… but when the people who loved him saw him die a horrible death including his side being pierced to be certain before sealing him in a tomb with Roman guards whose lives depended (and ended) upon keeping a dead body from moving anywhere…. then he showed up… alive and ate with them… everything changed going forward. What a reminder that we also can begin new – and allow those around us that same gift. Still how do you balance knowing how to read patterns against allowing for a change in each interaction? If someone in my life has a consistent record of being difficult to work with or treating my unkindly- does it cost me anything to approach each new interaction as potentially being positive or at least not bracing for the struggle before it even happens? Does it hurt me to always believe this time could be different, positive, and stay in the present observing what is there without dragging the negative history along? I think it’s often so under the surface that can be hard to recognize we do it. Cycles and patterns. As humans I think we put layers of protection in place so we’ll never be taken advantage of… never be caught with our guard down… fooled me once shame on me? There is a place for caution and protection certainly. But maybe in normal everyday life – when we aren’t truly in danger of emotional or physical damage– in fact those layers of protection eventually cause worse damage to ourselves . Maybe sometimes allowing for the change is an important step in seeing a change. Monday morning I got a call from the manager of the property my horses live. Good morning… I’ve got some bad news for you. Your horse is in heat… she jumped the fence this morning to get closer to the geldings. She doesn’t seem hurt but when I went to catch her myself or put her back over into your field she wouldn’t come near me and now she seems to be pretty happy eating the better grass in the middle field. There was a bad spot in the fence that had come down where she likely went over. I’ll head over to fix it in a few. Thought you’d want to know. She’s fine for the time being. Thanks I’ll run over and round her up. I figured I had my work cut out for me. But remembered what I’d been pondering. it’s ok. I’ll just take it as it comes when I get there. Who knows what I’ll actually find. Maybe the process will be fun- maybe I’ll learn something. Stay open to anything. And to my surprise, I found both mares in their own field where they belong and looking forward to seeing me. Khaleesi must have decided to come back through the gate when D was fixing the fence. AND… she came from the far end of the field straight to me when she saw me drive onto the property- not to the food either (which I’d set down to the left) but to me. Two days ago bucking off in protest, today right to me in friendly greeting. In this case I ended up with time to take a ride since she was so easy to catch and once again connected from field to saddle and trail and home again until I took off her halter and she hung out near me and I rubbed on her a little while more before I headed home. I wonder how this concept might help shape my week… month… season going forward. I’m not sure but I’ll be paying more attention each day. I’m at an odd sort of place where I could share a million little details of every barn visit… but then at the end I almost have nothing at all specific to say. While I’m in the moment there are a ton of things going on… little conversations… things I’m learning (like which brush Khaleesi prefers or what happens when I change the angle of my approach to pick up a hoof… why did Khaleesi just send Wild Heart over to check me out instead of approaching first herself like she did yesterday… ) and at the time they are all fascinating and then looking back it becomes one far away landscape of… well that was good. It’s a nice zone to exist in for the moment. It’s fun and rewarding and a glimpse of what I’ve been searching for since I began to consider getting a young horse back in 2013. A horse that only had what I put into her. For better or worse. I spent an hour this week riding in the yard. It was a nice warm winter day and I tied Wild Heart safely nearby and let her watch us work. I used what was already there to do some things like weave through landscape posts, move her hind end around a support pipe in the ground, sidepass through the wider space in the posts… we trotted and walked and made a few circles and explored. It was wildly fun. With each new maneuver I’d ask and let the mare figure it out. I gave her time to think and respond and process. She loved it. I loved it. When we finished she was soft and connected to me. Friday I decided to get out of the yard and the property and I took her to a place we can ride home from (we both love one way rides!). It was dry, warmish, and the footing was decent. I wanted to start getting back to some physical fitness. I trust her solid base of physical conditioning. This mare has been on a break since mid-November for any serious physical rides but I am not worried at all. The physical will be easy for her to regain. What I’ve done for the past two months is really deepen our mental work learned what I needed to understand to be a better leader so my horse is more focused on me and beginning to understand what I’m asking (and care) and it’s been a million times worth it. I’ve looked around me a while…. years… and wondered what seems off. Something just didn’t quite add up. 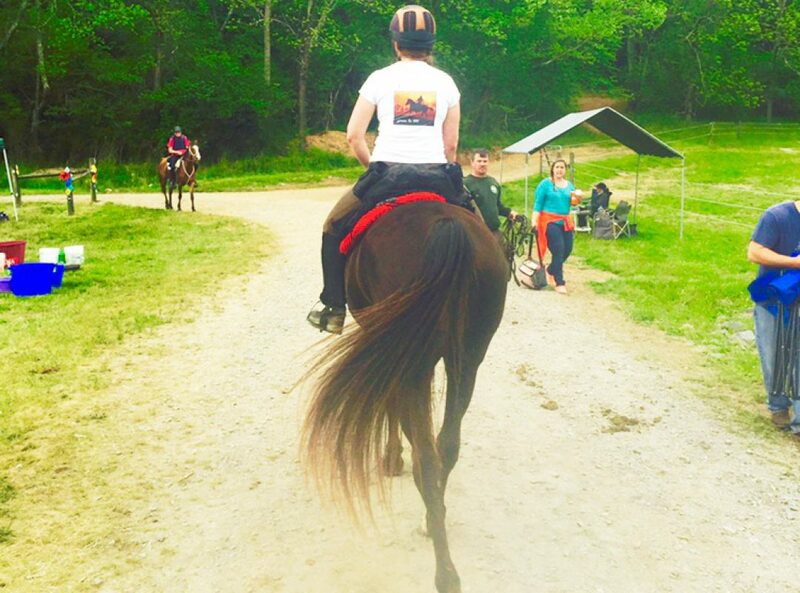 Then just go to a show… an organized trail ride camp… even a solitary barn.. anywhere there are horses and you see reality: physical tactics (human will or tools usually both) applied to get it done because the horse along the way said to some degree: no thank-you. I’ll pass. Your idea is stupid… or confusing… or something I’m not capable of today… or maybe I don’t like the way you treat me. If we can’t have the magic, we begin make due with boring reality. But what’s so amazing is with a horse… even just boring reality is so good we are usually still happy… sometimes we pretend things are all good and that might even work most of the time until things escalate. Sometimes people get on the horse mill looking for the magic one, sometimes they stick it out with the one that isn’t working and keep trying things to make the horse magical. Many horse people have such an iron will they are pretty good at insisting (hand raised here) and the horse has learned the consequences are usually not worth the trouble. Even more sad some people just give up on horses altogether… let down because the magic ended up so elusive, it was like believing too long in santa claus. It’s really easy to point my fingers around… but as with every blog I post I know because I am guilty. Yes. I have used physical force and training to fix my horse when I created the problem to begin with. I will probably do it again unfortunately and I am sorry in advance and promise to try to do better. I have come to believe through my searching that a big part of why this magic is so elusive is because we want something completely magically “two as one” but most of us seem to be so limited to the tools of unmagical physical attempts (at least I was). Can we imagine for a moment wanting a relationship with someone…. but let’s say we don’t share a language. So instead of slowing down and trying to find common language- which could take years especially since I’m not a language specialist… that’s too long… instead I start to drag the other around by the arm doing all the things I want him or her to do with me with very little understanding. The point that sticks out to ME the most in this example is what do I really want? If I really want the other person and the magic with them- it doesn’t matter how long it takes, I’ll always keep them as the center. I’ll never push them beyond what they understand. But if what I really want is to DO STUFF with someone else (you’ll do, come with me) then I’ll get bored with the process and drag them around to the activities I’d been so looking forward to. Do not give up on what you really want ultimately for something you think you want right now. If I build it focused on her, I have a better shot at that. The short term view is pushing her to do my activity and find tools and use my will to get it done so that at some point I risk causing physical damage because she goes along “respectfully” even when she’s not thriving, or I turn her off to the process and she eventually says: I’d rather not. I believe in the magic. I’ve seen it. I know it’s real. I will chase it until I die in pursuit. I do want to complete a 100 mile ride. I don’t have a talented Arab. I have a local grown mixed up bred horse that I happen to adore. So I need more than physical fitness, I’m going to also need brain and heart. But there also IS a physical component! Without question. Can’t I do both at the same time? Some people can!! I know some of them. They inspire me! But I’m getting closer… I’m definitely beginning to see some magic. But magic being what it is, one still has to learn it. I have to learn it- she’s a horse for goodness sake, she may carry the magic, but I have to sort out how to access it. And she has to choose to give it to me, I can’t ever take it, just like you can’t make someone choose you no matter how much you want them to- in a relationship it only thrives when all is given freely. She may never be as intelligent as me, but it’s going to take a lot of effort for me to become even half as sensitive and observant as she is, and no matter how much I LOVE this mare, it won’t matter if I don’t get better and understanding HER world. I’m going to have to somehow begin to train myself to be sensitive and observant on that kind of level. No wonder Monty Roberts works with deer herds! That’s what’s been going on in my barn these winter months. Slow, messy, human education. My Jedi powers are finally getting stronger. I felt more than ever before that I could think it and she did it. Not perfect. She didn’t always stop on a dime without a feel on the reins but sometimes she did… she didn’t always slow back down when she wanted to canter and I was saying trot right away- but sometimes she did! That ride was mostly trot and canter with some walking mixed in. She was a little out of breath and got a little sweaty but the mare did great and I have no doubt she’ll regain that fitness and strength without any problem. So many people say if you want to build your horse’s topline go climb hills, or back up hills… but I’ve been riding hills every ride of this mares life with me and though that might make my horses naturally more muscular in the topline than someone in the flatlands… methinks now that you can ride all the hills you want to but if the horse isn’t carrying herself like this you are never going to get the result you really want. I noticed good changes immediately when I switched – but the effect is compounding over time and 8 months. In other physical news her feet are getting better all the time. They are not where I envision them yet, but hooves takes years to grown so I’m working on patience and seeing the positive changes as progress. I’ve had to go up a boot size in the rear thank you Scoot boots for the slim sizes- they are still best on her hind feet. The new size 3slim boots with the supracore pads stayed on 100% in varied terrain and every gait including some full throttle canter sprints on Friday. The front boots are still doing well though I had to reattach the front right pattern strap once toward the end of the ride. She cantered through the rock piles. There are 3 ‘strips’ of the trail home that have about a 4 ft swath of large rocks that are now somewhat embedded into the trail but may have been leftover from years back when the road was used for logging. This horse knows where they are. I know where they are. We ALWAYS slow down and pick through them. I have no problem with that- they are some ugly rocks. It’s reasonable. She ran. Right. Over. Them. All 3 sections of them. I hope this could be a sign that the hoof program is going in the right direction. Especially because I am the hoof program!But I’m a little afraid to hope too much too early. I firmly believe that the time I’ve been spending learning my human part to meet her where she is and seek the magic at the risk of not meeting my physical goals or getting done my plans for the day… just as in how a human will do better physically when their spirit and mind are in order, has compounded what is going on with her physically as well. Maybe. Though it’s still too soon to tell… I have this little hope… Just maybe. This really is the year for this mare. I’m grateful that the ‘snow day’ closing this week came on a day that turned out beautiful in the afternoon. And finally after weeks of bitter cold I got back out on into the Great Arena of the woods and had a really stunning ride. I am trying a new pad in my boots from supracore. They are thin but I think will hold up longer and not difficult to cut to size. They are more expensive but if they work and last they will be well worth it. It was refreshing to see light through the trees in 40 degree temps and little wind, with the happy dogs in tow (they have been cooped up more than usual lately too) and a horse that is following my lead so to speak more each time. This is a quieter winter and I’m alone more but it’s been good to regroup and focus. I have a good feeling about 2018.